Looks Good from the Back: Adrien: Simple Summer Outfit. 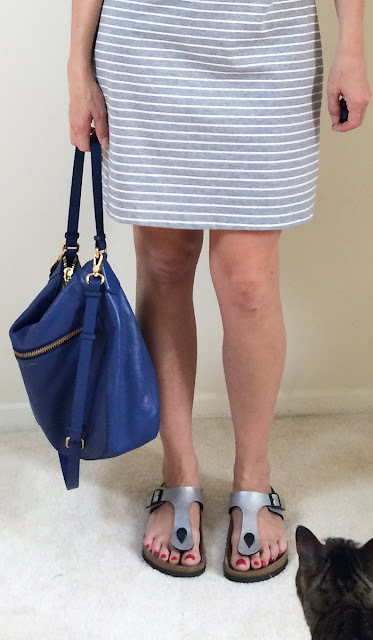 Nothing really exciting here, just a good example of how pared-down my style gets when the weather heats up. I bought this dress at Old Navy last summer and probably should've bought it in another color! It's a good, simple design. They have a very similar version available and also a few other cute dress options that seem work-appropriate. Also, may I add my voice to the others in favor of the indoor shots. You look great! It's all very Milk Studios. Also must be so much more pleasant than always trying to fit it in arounf your commute and judgey people walking by. Here are some of my favourite Paris bloggers with their dégagé white walls, so... very Parisian of you! I like the cat variable, too. It's all about the clunky! Get the sandals - I promise you no one on earth is going to think your ankles look scrawny. And thank you! Those links are great and I'm so happy the indoor shots are working for everyone. It's so much easier.